Make a batch of this low carb western omelet in a jar and you will have breakfast for 4 days. Just grab and cook for a minute or two in the microwave. 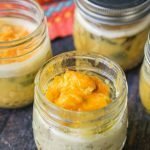 Each jar has just 4.3g net carbs and tastes delicious! Heat oil in a large saute pan. Add in the onions and peppers and saute until soft. Then add in the pepper and cook for a few more minutes. While the ham mixture is cooling, add the eggs and cream to a blender and blend on high for a few seconds. Season with salt and pepper and mix once more. Add the meat mixture to 4 jars. Pour the egg mixture over top and then sprinkle 1/4 cup of cheese on top. Add lid and refrigerate for up to 4 days. To cook, shake up jar and then take off the lid. Place in microwave and cook for 1 minute. Then cook for 15 seconds at a time while watching that the eggs don't overflow until cooked through. Let cool a few minutes before eating.